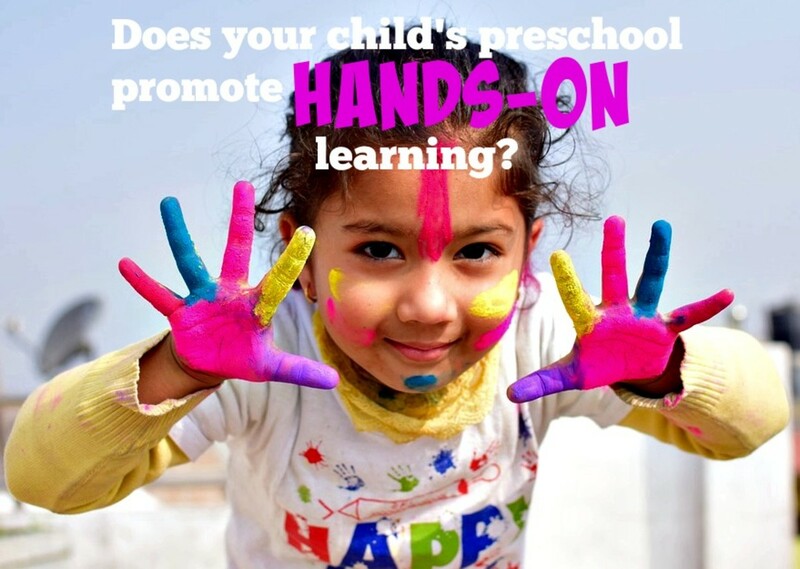 Does your child dislike going to preschool, but you don't understand why? Does your youngster come home after class, drained and wanting to be alone? Is the teacher concerned because your child refuses to participate in some of the day's activities? Are your youngster's favorite activities at preschool solitary pursuits such as reading books in the library corner and painting at the easel? If you're nodding your head "yes" to these questions, there's a good chance your child is an introvert like one-third to one-half of the human population. While being this way is typically not an issue, it can be at many preschools where the environment is anything but introvert-friendly. 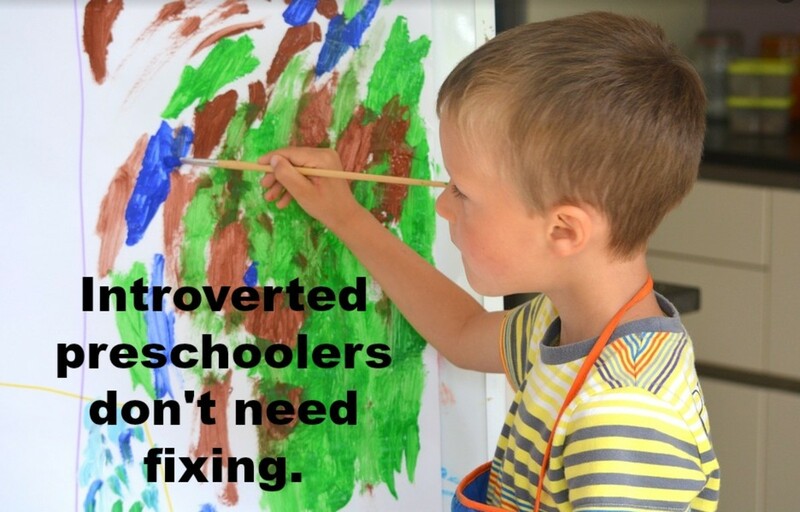 That's why moms and dads need to be discerning when choosing a preschool for their introverted children. As a long-time preschool teacher and a life-long introvert, I can say with great certainty that a child who dislikes preschool typically does so because it caters exclusively to extroverts. Introverts are left out of the equation when teachers plan the day's activities. Their needs go unaddressed so they're left feeling overwhelmed, frustrated, and alone. Most preschools today are academically focused with teachers under enormous pressure to prepare their students for kindergarten. The classroom is a non-stop bustle of activity with youngsters shifting from one activity to another with little or no opportunities for peace, quiet, and solitude. There are songs to be sung, games to be played, circle times to sit through, a schedule to be kept, and teacher-directed lessons to be taught about the calendar, the days of the week, the weather, the alphabet, numerals, and phonics. Introverts in the preschool class, needing time alone to recharge their batteries, are simply out of luck as they must endure the constant noise and continual social interaction. I am not boring or shy. I am an introvert: an artist, a lover, a dreamer, a fighter, a seeker. With twenty or more bodies crammed into a small space, the typical preschool environment is not conducive to the mental and emotional well-being of introverts, making them feel claustrophobic and uneasy. The sadness part of all is these little kids don't understand why they're miserable, can't articulate their uneasiness, and are powerless to get their needs met. Everyone around them looks happy and is having fun so they start to wonder: What's wrong with me? If only they knew they weren't alone, a part of some freakish minority, but that introverts like themselves make up one-third to one-half of the human population—at preschool and everywhere else on the planet! In my current job, I visit dozens of preschools each year, and my heart breaks for the introverts who must endure the typical preschool routine with no respite. If they need some peace and quiet to look at a book in a corner, walk outside to spend a moment in nature, or paint a picture at the easel in solitude, they're out of luck because there's no downtime in today's hectic preschool schedule. As an introvert myself, I feel enormous relief when I exit these chaotic environments for the sanctuary of my car. I also feel deep compassion for my fellow introverts inside that don't get to escape like I do. Yes, I'm an introvert. No, I'm not shy. No, I'm not stuck up. No, I'm not antisocial. I'm just listening. I'm just observing. I can't stand small talk...but I'll talk about life for hours. I'd rather be home with a close friend or 2 than among a big crowd of acquaintances. Don't scold me in public. Don't embarrass me in public. Respect that I'm reserved. And if I open myself up to you, know that means you're very special to me. While we now bend over backward to accommodate youngsters with ADHD, autism, Down syndrome, vision and hearing challenges, physical limitations, food allergies, and gender differences, there are no such attempts to help the introverts. When a child dislikes preschool, moms and dads often don't understand why. To them, especially if they're extroverts, it all looks warm and wonderful. Most preschool teachers are extroverts who love being with kids, hamming it up in front of a group, and constantly interacting with others. Because of this, many of them don't give much thought to the introverts, who make up a large portion of their class, and instead gear their instruction to the talkative, outgoing kids. It's not unusual for these teachers to see introverts as “painfully shy” and in need of fixing. They often communicate their concern to moms and dads with comments such as “instead of fully participating in our activities, she's only observing” and “he's often alone in the sandbox rather than interacting with the other kids.” In truth, observing instead of participating and playing alone at times instead of always in a group are perfectly normal behaviors, quite common for introverts, and no cause for alarm. As a former preschool teacher and an introvert myself, I believe Susan Cain's insightful book, Quiet: The Power of Introverts in a World That Can't Stop Talking, should be required reading for all early childhood educators. This is especially true since teachers get no training whatsoever in dealing with introverts. The author does a brilliant job of differentiating between being shy and being introverted and of detailing the many positive qualities of introverts. According to Cain, a shy youngster fears negative judgment and suffers because of it. She, therefore, needs help overcoming this debilitating problem. An introverted child, on the other hand, is perfectly well-adjusted, doesn't need intervention, but simply requires less stimulation. Most of all, she needs an enlightened teacher with a profound appreciation for what introverts have to offer in the classroom and in the world at large: thoughtfulness, sensitivity, creativity, and empathy. When visiting various preschools, I'm saddened by how small and inadequate so many of them are with kids literally tripping over themselves to move about the room. While this is most noticeably a problem for active kids, who need a lot of space and materials to explore, it's also a significant issue for introverts. An ideal preschool for them is comprised of multiple rooms and an outdoor area where they can have time alone when they want, enjoy the healthy benefits of being in nature, and not feel like they're just another sardine packed too tightly in a can. While extroverts are energized being around other people, introverts find it tiring. An enlightened preschool teacher is aware of this and always makes sure introverts have some much-needed space. So many conflicts in a typical preschool are caused by too many bodies in too little of a space. Hitting, pushing, grabbing, and arguing happen when kids get frustrated with one another but have nowhere else to go to cool down and relax in solitude. For an introvert, a tiny classroom can be hellish as she looks for any little corner where she can have a moment alone, but there's none to be had. It leads to her feeling trapped, depressed, and frustrated. Introverts are often exhausted when preschool is over for the day—not a good kind of tired from having so much fun but a bad kind of tired from feeling drained and depleted. It may take them a couple of hours at home alone in their room before they've recovered from the day's onslaught. I'm rarely bored alone; I am often bored in groups and crowds. When choosing a preschool for an introverted child, parents should keep in mind the room size and layout. They should make sure there's a cozy, quiet, and secluded class library where kids can steal away from the hubbub and look at books. They should make sure there's an art area where kids can enjoy open-ended art activities: painting at easels, making collages, coloring, stamping, molding with clay, and drawing. They should make certain there are private areas where one, two, or three kids can play with blocks and Legos without being trampled on or interrupted. They should also look for multiple dramatic play areas where kids can let their imaginations soar by dressing up and pretending to be different professions: doctors, veterinarians, chefs, teachers, and landscapers. With the new emphasis on preparing children for kindergarten, many preschools have ditched the relaxed pace many of us experienced as kids and are now doing everything at breakneck speed. When I visit these academically-driven places, the teachers often have kids divided into groups at so-called “stations” where they're engaged in an activity of some kind: working with math manipulatives, practicing the alphabet in a handwriting workbook, or doing puzzles of rhyming words. Every 15 minutes or so she'll ring a bell, signaling that the kids must immediately abandon what they're doing and move to a new station. While this approach may work for youngsters with short-attention spans who find it hard to sit still, it's pure torture for introverts who like to examine things closely, learn deeply, and explore at their own pace. Jean Piaget, the twentieth century Swiss psychologist known for his pioneering work in child development, said “children require long, uninterrupted periods of play and exploration.” Sadly, we've moved far away from this, and it greatly concerns many scholars in early child education. When kids are constantly rotating from one activity to another, their learning becomes superficial—dictated by the teacher's bell rather than their innate curiosity. Introverts especially need long blocks of uninterrupted time to explore and solve problems on their own schedule. They are their own best teachers. 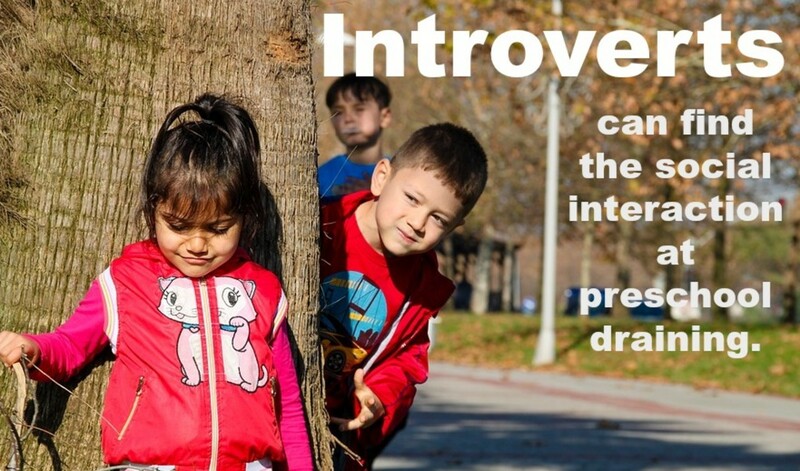 In your opinion, what's most important for introverted children at preschool? a book corner where they can read quietly. 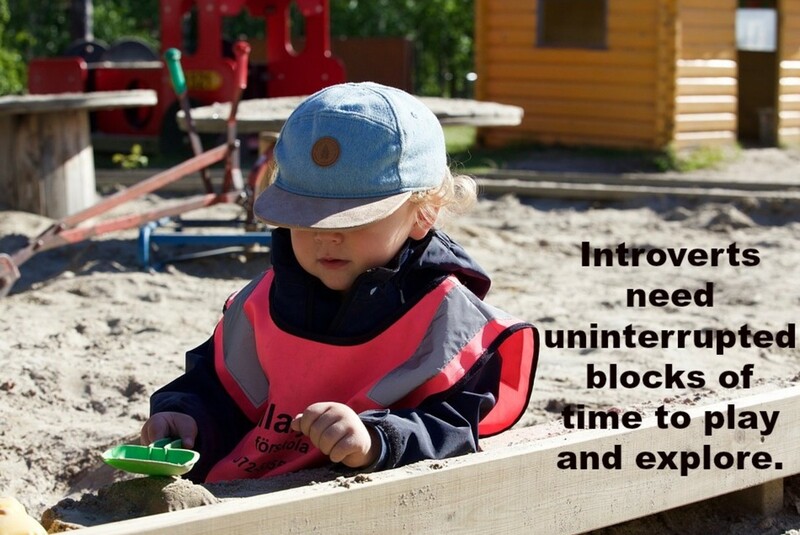 long blocks of uninterrupted time when they can play and explore. an understanding teacher who doesn't try to fix them. I bet you were a marvelous teacher, Bill. We definitely need more diversity among educators, including more introverts! When I was teaching, I always hated how the extroverts dominated the faculty meetings and the introverts like me didn't get a chance to contribute. Then I read that introverts think before they speak while extroverts think while speaking. It really goes to show that "wait time" in the classroom is so critical. 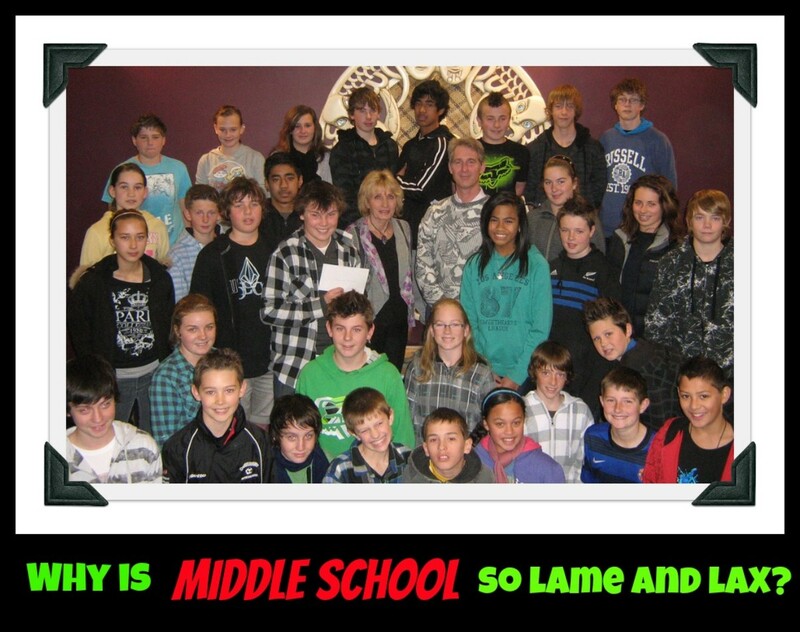 Luckily, for my students, I was an introvert. That I did understand. It is a tough go of it for introverts in school, for sure...thank you for bringing up this matter.